Somewhere along the way I learned about a scheduling method called Sabbath Schooling. In order to prevent burnout (for the kids or for the mama! ), the idea is you schedule six weeks of school followed by one week off, the Sabbath Week! When we first started homeschooling I didn't set out planning to make our school year match the calendar year, but both the kids birthdays are in November and we like to take off plenty of time for the holidays to be with family and attend Thanksgiving and Christmas events. So it works out best for us to school through the miserably hot summer and have extra time off in the spring and fall when the weather is nice. We finished our last school year just before November and took a 3 month break (our "summer" vacation). We started our new school year a couple weeks ago, but before I tell you how it's been going, let me share with you our curriculum choices for our new school year. Our core this year is My Father's World's Exploring Countries and Cultures (here on out known as MFW ECC) curriculum. Here are the details. We will be studying the book of Matthew and taking a look at the lives of some Christian heroes. We're moving on with Singapore Math. This year Miss M is ready for Primary Mathematics 2B and 3A. Fridays will be math game day instead of a lesson from the book and we'll be drilling basic math facts every day! English: Last year we worked through the first half of Primary Language Lessons; this year we will be working through the second half of the book. I picked up the Teacher's Guide last year at a curriculum fair and it was helpful for answering some of the more dated questions, but I didn't use any of the lesson extenders. This year I plan to incorporate more of them. That way we can do just two PLL lessons per week, but have English four days a week (with vocabulary copywork for our 5th day). Spelling: My good speller will be continuing on with Level F in Spelling Power. Folks, that's 7th grade level spelling for my 7-year-old! I continue to be bowled over by her natural spelling prowess! I'm stepping it up this year by incorporating the Skill Building Activity cards that are included on the Spelling Power CD. I especially appreciate the ones that focus on dictionary skills. Foreign Language: I've struggled with knowing how to teach Tagalog to my kids when I don't speak it. We have Rosetta Stone Tagalog, but it's difficult to switch over our computer settings and get it started as often as I'd like them to be using it. We'll still use it -- more-so as they get older -- but in the mean time I bought a pack of flashcards that came with a pronunciation CD and vocabulary poster. We'll just be using the blue pack this year. The other pack will be for next year. I plan to focus on building vocabulary and engaging with the words just a few minutes per day. The flash cards in the blue pack cover Family, Colors, Numbers, Clothes, Animals, Food, My Body, and My Day. (By contrast, next year using the orange pack we'll learn about Nature, Weather, Opposites, Actions, Things I Like to Do, At My House, and Going to Different Places.) Each pack also has some basic phrases like hello, yes, no, etc. Reading: This year Miss M will be spending equivalent amounts of time reading to herself and listening to books read aloud. We're starting off the year reading The Secret Garden. She received it for Christmas and we've been enjoying it very much! 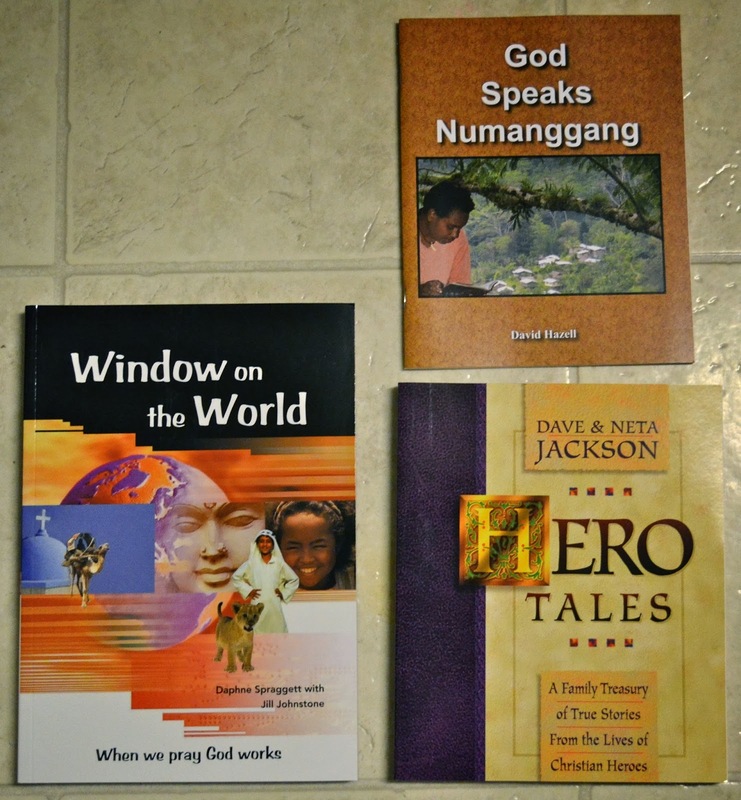 Once we're through with that, we'll read aloud a book for each MFW ECC country we're studying as well as these stories of missionaries from around the world. And of course any other books that catch our fancy! Little Guy most often listens in when we read aloud, and I'm always amazed at how much he picks up or the insightful questions he asks. Our social studies this year is focused more on geography and cultural anthropology than on history. This will help set the stage for future years as the kids will have a grasp on where things happen when we study them. We will be taking a "trip around the world" that spans two years. In order to accomplish this, I'm stretching out the study of the MFW ECC countries as well as adding additional countries from Confessions of a Homeschooler's Expedition Earth curriculum (plus one or two I'll have to make up on my own). This year will take us through North & South America and Europe. Next year we'll hit Africa, Asia, Australia, and Antarctica. I have always loved geography and I'm very much looking forward to flinging open the doors of the world to my children! Music: We aren't doing much formal music study this year. I'll be teaching the kids some hymns of the Christian faith, particularly those that relate to our study of Matthew and missionaries, and we'll be learning the songs from the Wee Kids Sing Around the World CD. The kids and I all love to sing, so this is a fun and gentle subject that we all appreciate! Art: Another add-on to our curriculum this year is Confessions of a Homeschooler's The World's Greatest Artists Vol. 1. I want to expose my children to good art, but don't have much experience in that area myself, so I figured this was a good place to start! I had some full-color prints made at Staples for our first artist and it was very inexpensive! Less than $1 per 8x10 sheet. Of course, we'll be doing many arts & crafts projects this year; the kids just adore making things and I have fun with it too! Alongside all of this, Little Guy will be doing Kindergarten. I will be stretching out MFW K into a two year program, first as a year of 2-day K4 and then as a 3-day K5 program. Since he joins in on so much of our other work, I think this will work out perfectly! He's already so excited to be doing his own school -- he misses his playmate dreadfully when she's off with her lessons and he's left to play by himself! I only got the Basic set of My Father's World Kindergarten. I already had some of the other materials included in the Deluxe set, so I didn't feel it was necessary to spend the extra money on it. More about how K looks for us later! We are all so excited for our new school year! And I can't wait to come back and tell you how our first week went!